The Aerocart wheelbarrow makes light work of heavy loads. Go ahead and load this lightweight wheelbarrow up with wood, rocks, bricks, dirt or anything else you may need to haul. This is way more than your average garden wheelbarrow. Using the best in two-wheel wheelbarrow design, you can carry up to 300 lbs. The innovative design will make moving items easier than ever. You will save countless time and effort while significantly reducing the strain of moving heavy objects when you use the best wheelbarrow for the job. Need to move large items? Simply convert the Aerocart wheelbarrow to a dolly and move the bottom flap down and you now have a heavy duty hand truck. This is great for moving appliances, large boxes, and bulky furniture. The Hand truck has a 300 lb capacity, making it very versatile while making the load feel light weight. The included Potted Plant Mover and mesh rock holder make moving those heavy awkward items with a garden wheelbarrow easy. Simply strap the potted plant in the potted plant mover and hook it to the extension arms and you are ready to go. The Rock mover allows you to roll the rock into the mesh, clip it on and go. Both have an 80 lb capacity. The extension arms easily fold out from the Aerocart wheelbarrow for carrying bulky items. You can now move large bags of mulch and dirt around your yard. The extension arms become a personal fork lift allowing you to move items like oversized tools and patio furniture up to 80 lbs. The included bag holder easily snaps onto the main frame of the Aerocart wheelbarrow and allows you to hold lawn and leaf bags, freeing both of your hands to work. Once you are done loading the bag you can roll it right out to the curb or any place you need to keep it. The included cylinder holder clips into the cart frame and allows you to move over-sized round objects like buckets, barrels, trash cans and water jugs. The lightweight wheelbarrow design keeps these items from rolling off, eliminating the need for you to hold it in place while moving the item. You no longer need to drag, push or carry those awkward items. Using the best two-wheel wheelbarrow, you just load them up and go. The Worx Aerocart is an 8-in-1 all-purpose mover and lifter. The Aerocart combines the capabilities of a wheelbarrow, hand truck dolly, extended dolly, bag holder, cylinder holder, rock lifter & mover, flower pot carrier, and trailer mover all in one. The Aerocart is more than just a unique tool. It’s an entire work system that transforms from function to function simply & easily. And the Aerocart is designed to perform with very little effort on your part. Additional accessories take you beyond just 8 applications and make your Aerocart a must-have, all-season tool. The Wheelbarrow Wagon Kit transforms your Aerocart into a garden wagon, a portable seat and workspace to make spring planting a breeze. Add on a Tub Organizer to transform it into an organized utility cart. Got snow? The Wheelbarrow Snow Plow attachment converts it to an easy-to-use snow plow. How many jobs can the Worx Aerocart perform? The applications for the Aerocart are limitless and start with 8 different configurations. 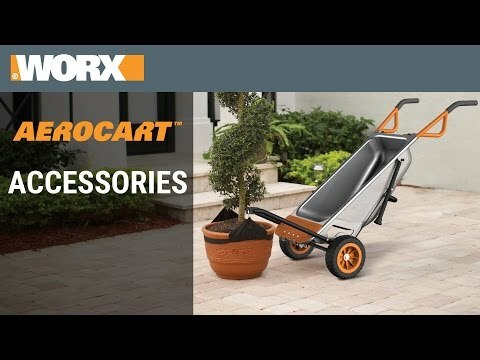 The Worx Aerocart can transform into a Wheelbarrow, Hand Truck/dolly, Extended Dolly, Bag Holder, Cylinder Holder, Rock Mover, Plant Mover, and Trailer Mover. Optional accessories expand the Aerocart’s utility even further. Using the wagon kit, you can convert the Aerocart into a garden wagon or utility cart. Worx even offers a Snow Plow attachment to get the most out of Aerocart in EVERY season! How can the Aerocart convert to so many different tools? Converting the Aerocart is simple and fast. To convert between the Wheelbarrow and Dolly, simply pull the Release Knob on the side of the cart. Fold or unfold the legs as needed. They lock into place automatically. For Dolly mode, slide the Dolly Flap Plate to the right and fold it down. It will lock into place automatically. Helpful Hint: When converting between Dolly and Wheelbarrow, tip the Aerocart forward so that no weight is on the wheels. Then pull the Release Knob. To convert to the Extended Dolly, Plant Mover or Rock Mover, fold down the Extension Arm. Stack materials directly on top of the Extension Arm, or attach the proper strap for moving rocks or potted plants. The Bag and Cylinder Holders hook directly into the frame of the AeroCart. Use the Aerocart to move trailers simply by attaching your hitch ball to the Dolly Flap when the cart is in Wheelbarrow mode. How do I make the Dolly Flap fold up and down? Stand in front of the Aerocart. Slide the flap firmly to the right and move the flap up or down. How does the Aerocart make the load feel lighter? The Aerocart exploits the physics of leverage. As a Wheelbarrow, the Aerocart tub is specially shaped to concentrate the center of gravity directly over the wheels for a perfectly balanced load that can be lifted and moved with ease. The two wheels improve stability so the Aerocart will not tip over like a standard wheelbarrow. In Dolly mode, the wheels automatically shift forward, closer to the Dolly flap and the center of gravity, creating leverage that makes lifting the load easier. Will the Aerocart tip over? The Aerocart is very difficult to tip over. The two oversized wheels are self-balancing and lend tremendous stability side to side. What is the capacity of the Aerocart tub? The Aerocart will hold between 3 and 4 cubic feet of material. How much weight can the Aerocart hold? The Worx Aerocart will hold up to 300 pounds in wheelbarrow and dolly mode. How much weight can the Extended Dolly lift? Up to 80 pounds of material can be stacked on the Aerocart's Extended Dolly arms. How much weight can the Plant Mover or Rock Mover lift? The Worx Aerocart can lift a potted plant, large rock, and many other items using the Extension Arm and proper strap. Maximum weight for items lifted using the Extension Arm is 80 pounds. How much weight can the Bag Holder hold? The Bag Holder can support a bag weighing as much as 40 pounds. How much weight can the Cylinder Holder hold? The Cylinder holder can support up to 80 pounds. I read that using a trailer ball, the Worx Aerocart can even move trailers. What is the maximum size of trailer that the Aerocart can move? The trailer’s size is not as important as the weight. Maximum trailer weight is 1000 pounds, and maximum tongue weight is 100 pounds. Of what material is the Aerocart made? The Worx Aerocart is made of steel. Of what material are the tires made? The Aerocart’s flat free tires are polyurethane and will never need inflating. The wheel hubs are polypropylene. What is a Flat-Free tire? The Aerocart’s tires are made of solid polypropylene. The tires are soft and absorb shock like a regular tire, but there no inner tube or air requirement. The tire can never go flat and never needs inflating. Ever. How much does the Aerocart weigh? The Aerocart, when fully assembled with handles and wheels but no other attachments, weighs 39 pounds. The Worx Aerocart is painted with a thick powder coating to protect the surface and prevent rust. But since the main components are solid steel, as the cart is exposed to wear and tear from the rigors of outdoor use, the Aerocart may show signs of rust similar to any other steel implement. How can I store the Aerocart? For such a powerhouse of a garden tool, the Aerocart needs surprisingly little room for storage – only 15” from the wall! Convert the Aerocart to Dolly mode and stand it where you want. The handles can be removed, if desired, to conserve the most space during storage. Is the Aerocart easy to assemble? The Aerocart is very easy to assemble, takes less than 5 minutes and requires no tools. Once out of the box, insert the two handles into the frame and lock them in. Place the Wheel Shaft through each of the two wheels. Insert the Wheel Shaft in the axle and clip on the Shaft Lock Pin. That’s it. Your Aerocart is yardwork-ready. NOTE: The handles come off the cart just as quickly, making it easy to transport in the truck of a car or back of an SUV, or to minimize storage space. 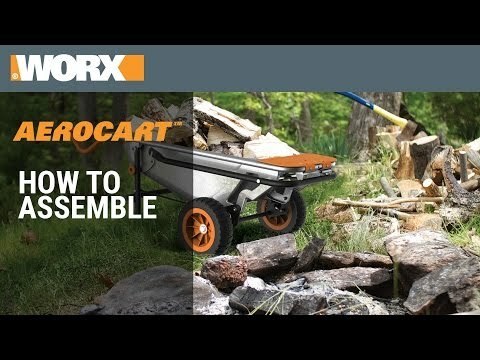 Why is the Worx Aerocart more narrow than other wheelbarrows? Ordinary wheelbarrows are limited in their usefulness because they can’t go everywhere. The Aerocart is specially designed to fit through garden gates and even doors. The wheels are 23.5” apart so an Aerocart in Dolly mode rolls up and down a standard truck loading ramp with ease. Explore what more you can do with a tool that’s more than just a wheelbarrow. What are the dimensions of the Aerocart when assembled? If you decide the Worx Aerocart isn’t the right tool for you, we offer a 30-day Money Back Guarantee from date of receipt (less shipping and handling). Please call our customer service center at 1-866-354-9679 (WORX) and we’ll be happy to assist. View more information here. We know your tools are indispensable, so we cover each tool with a 2 Year Limited Consumer Warranty. You can extend your warranty to 3 years by registering online within 30 days of purchase. Already have your Aerocart? Register now! Lose a handle? Many replacement parts are available online under Accessories. 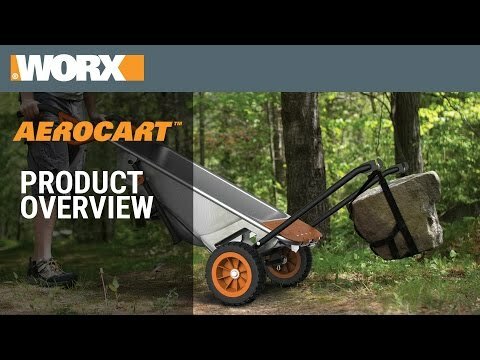 "WORX’s Aerocart looks like a wheelbarrow. Until you transform it into a hand truck, a wagon, or a basic forklift." The WORX Aerocart 8-in-1 Wheelbarrow/Yard Cart/Dolly was named to This Old House’s list of “Top 100: Best New Home Products in 2014.” Check out the article and read what they had to say about the Aerocart. Aerocart 8-in-1 Wheelbarrow / Yard Cart / Dolly is rated 4.7 out of 5 by 3597. Rated 5 out of 5 by Pwynot from Exactly what I needed. I bought this to replace my wheel barrel that the wheel was always flat on and hard to maneuver. The Aerocart fits my needs perfectly. I’m a 60 year old and needed something I can pull on rough ground. Got the snow plow attachment and am looking forward to see how it will work this coming Winter. Rated 5 out of 5 by CRay72 from Complete back saver I'm digging out the landscaping rock that surrounds my house. the loads can be quite heavy, and a normal wheelbarrow with one front wheel has dumped more than one load. This design is fantastic. I can't wait to use it on other projects. Rated 5 out of 5 by Sidecarnutz from Well made and good value! Mine came in today. Very well and thoughtfully packaged. Just 5 minutes to assemble and no tools needed. The steel construction impressed me. I was worried that at this price point the tub would be cheap plastic. Pleased to see its 18 gage steel. Everything fit and functioned perfectly. I'm getting older and I'm disabled and can't carry heavy bags of yard waste out to the curb like I did when I was younger. This will take the place of my old and badly work hand truck ands do a better job of it! My neighbor saw it and now she wants to get one too. Very nice tool with a excellent level of design engineering in it! Rated 5 out of 5 by JaneyO from I bought this about 5 yrs. ago.Made to last-forever? Heavy duty construction.! Love it ! Rated 5 out of 5 by JDN45 from Incredible Tool! I purchased the Areocart about a month ago for a large landscaping project. This required moving and placement of many large boulders from 80 to 250+ pounds and over 7 c/y of River rock and much more. I’m not saying that it was EASY but the AREOCARTdid the job perfectly. I can’t say enough about how much I like my Areocart,So much i just purchased the SNOWPLOW attachment! Rated 5 out of 5 by Bricoleur from An Impressive Array of Features Very impressed by the solid bild and stability of this piece. It's small enough to fit where a standard sized wheelbarrow won't, yet large enough to do a full sized job. Rated 5 out of 5 by CamT from Had mine two weeks--best wheelbarrow I have owned. Spent last weekend getting the front yard read for spring. I have two other wheelbarrows, one with a single wheel and one with two wheels. The problem with them is how high I have to lift the bags of mulch and potting soil. With the Work I can roll them on to the carryer and move them to where I needd them without lifting. Rated 5 out of 5 by sdvine732 from Everything I needed rolled into one!! Just bought a house and needed lawn tools. Saw this advertisement and thought BINGO!! Couldnt have asked for better timing. Cant wait to get it together and start primping up the yard!! Rated 5 out of 5 by ChicagoGardener from Wow I should have bought this years ago. Moving large planters and pots is now a breeze. So much easier to wield than our full sized wheelbarrow (gifted to our unsuspecting neighbor). Perfect for a city garden and MUCH easier to store. Rated 5 out of 5 by NCFA from One of the BEST garden tools! My wife got this for me for Christmas, but due to health issues I didn't even assemble it until 03/257/19. Now that all pieces are together, I really love it. Got the wagon kit and snowplow it with the cart, and all are assembled and work together easily. Everything fit perfectly, no problems assembling with NO tools but what is in the box. The wagon kit is essential for gardeners - sit, roll, carry everything you need, and much easier on the back! Rated 5 out of 5 by MAPH from Solid & Versatile Had been thinking about getting this for over a year. Suddenly came up on sale with an additional percent off. The time was finally right, I purchased one. So far, all I've done is assemble it. But, when you put something together yourself, you get a good feel for its quality, design and engineering. Was not disappointed. I know I will get many years of dependable and versatile use out of it. No regrets here. Rated 5 out of 5 by Jen60 from Light weight and many features Tires will not go flat easy to use excellent product. Rated 5 out of 5 by DMB3 from My Go-to Yard Helper My wife gave this to me and I questioned why I'd need "another wheelbarrow." This is SO much more and has saved my aging back. We've moved heavy plants, 80# bags of concrete, etc. Whether as a wheelbarrow or a hand truck, this is the greatest addition to help manage our woods and garden. Rated 5 out of 5 by Mike77 from So much more useful than a standard wheelbarrow. Rated 5 out of 5 by Bob827 from Great multipurpose yard tool. Received this a little over a week ago and already it has paid for itself. Easy to use, rugged and stores easily. Rated 5 out of 5 by Aaron27 from As Advertised! Ive used this multiple times for various projects. Very useful for my yard work duties. The hand truck function was very helpful in moving a couple things around my house up and down a flight of steps. Rated 5 out of 5 by Lla14 from Great features! It has so many uses that I need. It was way to assemble. I am able to move my washer and dryer out of the way so I can install some new flooring. Can't wait to start gardening. Rated 5 out of 5 by Peter 61 from Great value for the money. Multiple use. Have used this for moving stuff around and for gardening. Rated 5 out of 5 by Patti69 from Great buy. Zu Purchased cart while it was on sale. Have used on a number of projects already. Love it. Rated 5 out of 5 by Trannymd from Awesome tool This tool is so versatile that I don't know what took me so long to purchase it.Even my wife loves this thing. Rated 5 out of 5 by bigandsmall1 from She loves it We bought this three years ago. She can do some much with it. Rated 5 out of 5 by leeny from Handy Dandy Tool I bought this to move my plants in big planters around in spring and can not wait to use it. Looking forward to the ease of spring cleanup and landscaping projects. Rated 5 out of 5 by Woodypr from Just what I was looking for Although I am a tool lover, I never thought I would invest on a wheelbarrow. The moment I saw it, I knew it was a perfect match for my needs, a wheelbarrow, a trailer mover, a rock mover, a leaf bag holder, a plant mover, a dolly and other features. It is for the time being my best investment for the price. Rated 5 out of 5 by DannyO from An awesome tool on wheels! Strong and well built. Used it all winter with snowplow blade, which worked even better than I hoped. A real back saver! Rated 5 out of 5 by Sandy H from Great features I really like using this product It is versatile and I really like it being low to the ground. Rated 5 out of 5 by Gabe Marin from A must have multi tool. Strong build , durable . Rated 5 out of 5 by Mom to 2and 2 from Love the Aerocart Bought this last year have been trying to order the water bag ever since it’s been out of stock every time!!! Now I’m ticked!!! Just tried to order it again and it’s discontinued ... it the main reason I bought the Aerocart!!!! Rated 5 out of 5 by lj6409 from Have 2, with a 3rd on the way !!! The first one was purchased 6-8 years ago, and still use every day, although I have reinforced the arms, that pick up large pots, and move planters in and out of greenhouses, and around the yard. The second was purchased with the wagon/gardening cart, water bladder, and the snow plow, which worked wonders this winter, and I was able to clean my driveway, and neighbors driveways, who had health problems. I also have back problems, and these carts save my back from any lifting or carrying. I just purchased a third cart, and will keep 2 as my little hand fork lift, and one as a wagon, for weeding, and sitting while working on raised garden boxes. I have most of the worx tools, atleast the 20v power share tools, and talk very highly of each of them. Try These Great Aerocart Accessories!